Das Ebook iPod touch User Guide for iOS 11 von Apple Inc. wurde am 19.09.2017 veröffentlicht und platzierte sich erstmals am 20.09.2017 auf Platz 63 der myCharts365 Top-100-Ebook-Charts. Die bisher beste Platzierung erreichte das Ebook iPod touch User Guide for iOS 11 von Apple Inc. mit dem 63. Platz am 20.09.2017, die aktuell letztmalige Platzierung in den myCharts365 Top-100-Ebook-Charts erreichte es am 23.09.2017 mit Platz 81. Damit war iPod touch User Guide for iOS 11 von Apple Inc. bisher insgesamt 2 Tage in den myCharts365 Top-100-Ebook-Charts vertreten. Here's everything you need to know about iPod touch. Get to know iPod touch and discover all the amazing things it can do, and how to do them. 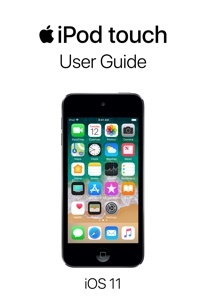 It's the definitive guide for getting the most from your new iPod touch, straight from Apple. The iPod touch User Guide is an essential part of any iBooks library.